The other day we got a look at the new 'Pacific Rim' trailer, which was filled with incredible footage originally meant exclusively for the WonderCon crowd, and today continues that same feeling of excitement with a brand-new poster for Guillermo del Toro's monsters-vs-giant-robot battle. We couldn't describe this film any better than how Charlie Day did in the latest footage: "It's 2,500 tons of awesome!" 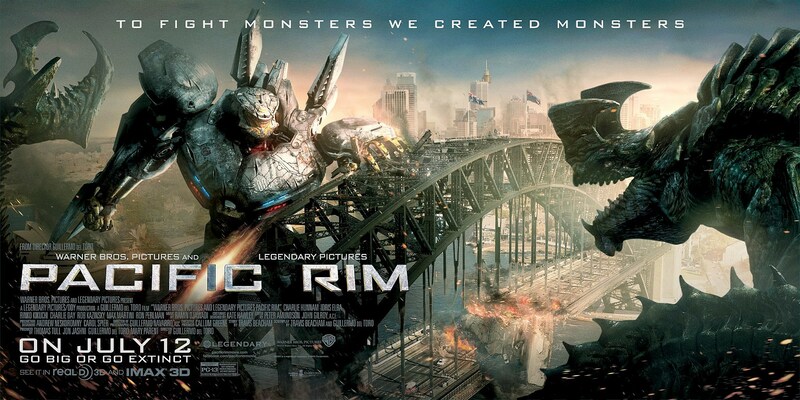 When giant monsters known as Kaiju rise out of the ocean to attack the most densely populated cities of the world, humanity responds with its own army of monsters -- giant Jaeger robots strong enough to beat these beasts senseless with oil tankers. And just when we thought there couldn't be more amazing-ness (yes, we just coined the term), here comes this new 'Pacific Rim' poster featuring a snapshot of this epic battle in action. The cast for the film includes names like 'Sons of Anarchy's' Charlie Hunnam and Ron Perlman, Rinko Kikuchi and Idris Elba, but we're more excited for the action and fight sequences. Click the poster below to download your own version.